Fendi is one of those lines that creates an "It" bag almost every single season. Its style is characterized by a strongly traditional Italian aesthetic with a little extra bling. 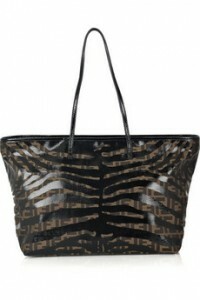 Unlike its sister bag, The Zucca Snake Print Tote, this version definitely screams Fendi. The black patent zebra print lets its signature logo canvas show right through. This is a really interesting new way to treat the logo bag, and frankly, I like it better than a plain canvas bag covered with Fs. The size is great for carrying on a full day of errands, but honestly, I'm not really sure that these straps are the best choice. They're a little skinny, and I can imagine that once this baby gets full, those straps will dig in deeply to your shoulder. Other than the straps, I think that this tote is a cool way to carry your everyday stuff stylishly.